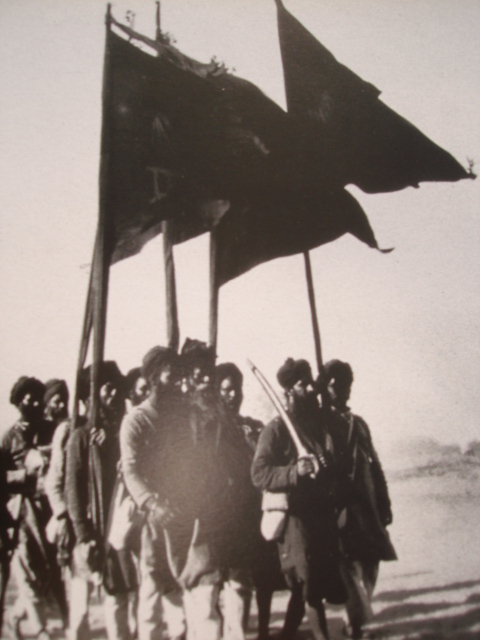 Guru Ka Bagh Morcha 08 August 1922 The peaceful non-violent Morcha (agitation) of Guru Ka Bagh was launched for emancipation of a Gurdwara Sahib from the stronghold of Mahant Sunder Dass in 1922 A.D. 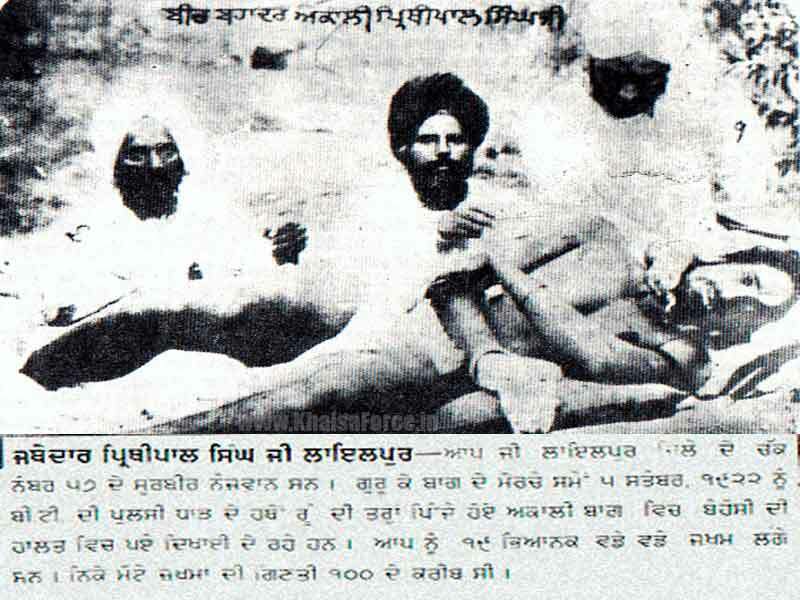 In September 1922 there was a peaceful protest against the Mahant Sunder Daas who disrespected Guru Ka Bagh Gurdwara. He was given full support by the police who severely beat Sikhs with bamboo sticks. In all, 5606 Sikhs are arrested, 1500 seriously injured and dozens killed during a period of 3 months. Andrews witnessed the brutality and inhumanity and stated that he “saw hundreds of Christs suffering the cross daily”. Eventually the British government conceded and handed back control of the Gurdwara to the Sikhs. 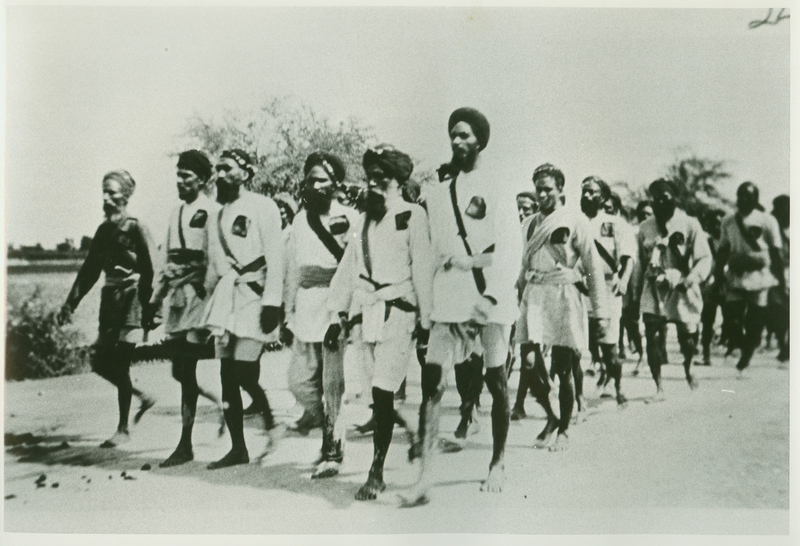 The Morcha ended on 17 November 1922 after the demands were conceded. 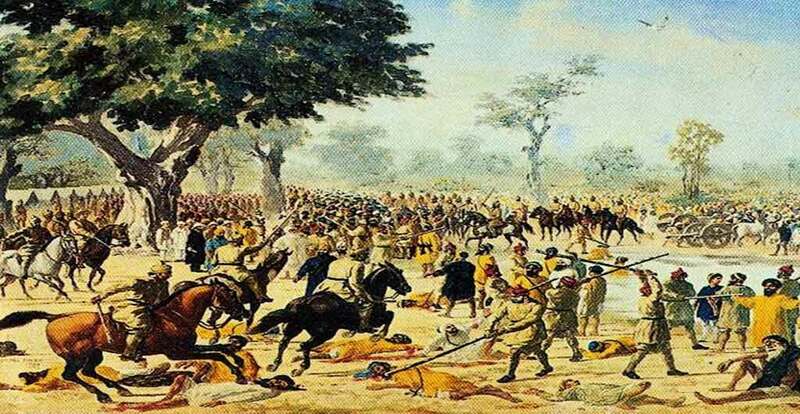 The peaceful conduct of the Sikh’s while bearing merciless beating with Lathis and sufferring severe physical injuries won admiration all over the world. This article which outlines the story of the Historical 400 years old Guru ka Bagh in Ghukkevali village, of Tehsil Ajnala, District Amritsar, of Punjab, is an account of a major campaign, just one of the many struggles by the Sikhs in the early 1920s, to seek justice, in regaining control of their own houses of worship. Many Gurdwaras had already been freed without much of a problem, but this one would prove to be a bigger hurdle. Ghukkevali village, which is located about 20 km from Amritsar, has two historic gurdwaras located close to each other. One commemorates the visit of Guru Arjan in 1585. The other, laid out on the site of a bagh (garden), which gave it its name, is associated with a visit from Guru Tegh Bahadur in 1664. In 1921, Sundar Das Udasi was the mahant of Guru ka Bagh. He was indifferent to his ecclesiastical duties and lived a dissolute life, squandering the resources of the gurdwara. In an attempt to save the shrine from being occupied by reformist Sikhs, he signed a formal agreement with them on 31 January 1921, promising to reform his ways and make a new start, as well as, agreeing to receive the rites of Khalsa initiation. He even agreed to serve under an eleven member committee appointed by the Shiromani Gurdwara Parbandhak Committee. 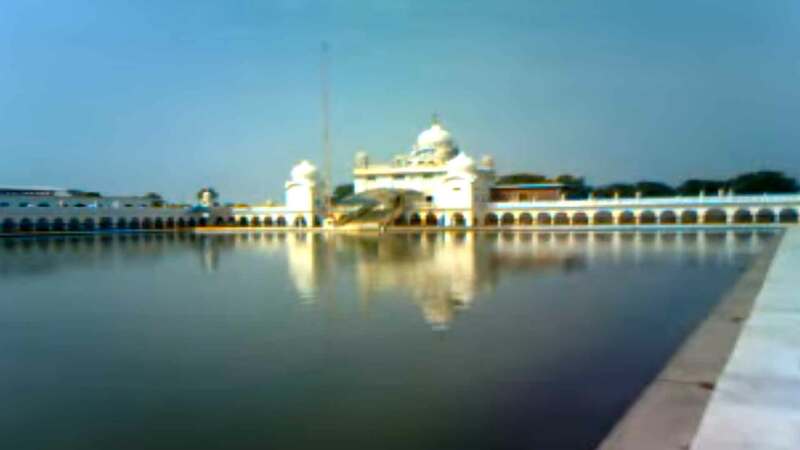 However, seeing how the government was everywhere supporting the mahants in their efforts to retain the Gurdwaras, he repudiated part of the agreement and said that, though he had surrendered the gurdwara to the Shiromani Committee, the piece of land known as Guru ka Bagh attached to it was still his property. He objected to the Sikhs cutting down trees on that land for firewood to be used in the Guru ka Langar. The police, willing to oblige him, on August 9, 1922 arrested first five Sikhs Bhai Santokh Singh Lashkari Nangal, Bhai Labh Singh Rajasansi, Bhai Labh Singh Matte Nangal, Bhai Santa Singh Massa(Nakodar) and Bhai Phula Singh on charges of trespass. These arrests were not madet on Sundar Das’ complaint, but on a confidential report received by the police. The following day, the arrested Sikhs were hurriedly tried and sentenced six months of rigorous imprisonment. They were also fined 50 rupee each and FIR case number 1288. This sparked off the agitation, and the Shiromani Gurdwara Parbandhak Committee decided to daily send a batch of five Sikhs to chop firewood from the grove of trees, on the land of Gurdwara Guru ka Bagh and court arrest if prevented from doing so. So undeterred by the action of the government, the Sikhs continued the old practice of hewing wood from Guru ka Bagh Morcha for the daily requirements of the community kitchen. From 22 August 1922, police began to arrest the jathas on charges of theft, riot and criminal trespass. The arrests gave a boost to the movement as more and more Sikhs came forward to join the protest. 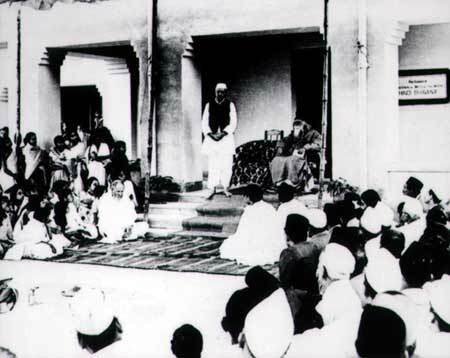 On 25 August 1922, Amavas day, the gathering was so large that S.G.M. Beatty, Additional Superintendent of Police, ordered the police to disperse the Sangat by a lathi-charge. From about this time, as the process of arrests and convictions was proving of little effect, the police began trying a new technique of terrorizing the reformers. Those who came to cut firewood from Guru ka Bagh were beaten up in a merciless manner until they lay senseless on the ground. With their Dastars ripped off they were then dragged by their hair and left contemptuously discarded by the fields when the police thought they had enough beating to be totally subdued. 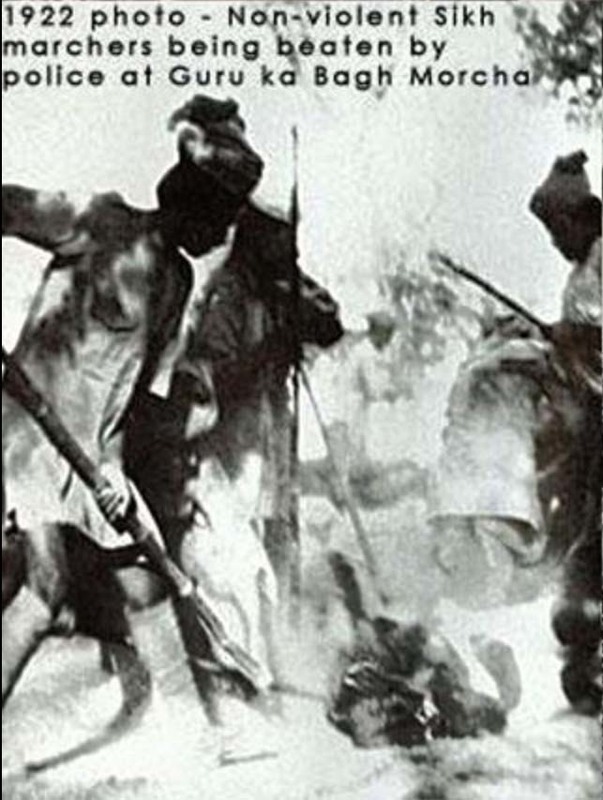 The Sikhs suffered all this stoically and arrived, each day, in larger numbers to submit themselves to this beating. From August 31, the number arriving to this site was raised to 100. Every day a batch of one hundred volunteers would start from the Akal Takht pledged to suffer their fate silently. The police would stop them on the way and slash them with heavy brass-bound sticks and rifle-butts. This punishment continued until the whole batch lay prostrate on the ground and none could stand any more. The Sikhs displayed unique powers of self-control and resolution, and bore the bodily torment in a spirit of complete resignation. None of them winced or raised a hand in defiance. 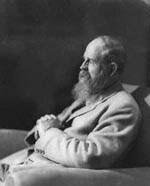 Reverend Charles Freer Andrew was a young Christian Anglican Priest from England during the British Raaj who was dear friend of the Sikhs. He had come to India as a priest, and later became a teacher, writer, journalist, translator, columnist, newspaper-correspondent, editor, educationalist, labour leader, mediator, activist, spokesman, and leader. Reverend Andrews became the conscience of the British Raaj, questioning every tactic and strategy and demanding that all parties walk the straight line and do the right thing. He soon made enemies that wanted to stop his work. The British authorities found him to be a thorn in their side – an Englishman constantly questioning their motives and their methods. Some saw him as betraying his land of birth, even the very Faith he had been sent to preach. It didn’t help when he offered to resign from his Church and priesthood. On the other hand, many Indians worried if he was a British spy. Andrews began by attacking the very methods of Christian proselytization in India – and don’t forget that he was a priest sent to India to help convert the masses! He questioned the Western and Eurocentric view of Christianity, and demanded that it embrace humanity, not just what he himself referred to as the “white races”. It didn’t take long before he went further and introduced the revolutionary idea that all Indians were to be treated as equals with the rest of the citizens of the Empire! He argued they were British subjects. He began to publicly sell the idea that the only way Indians would ever achieve equality would be through complete independence from Britain. 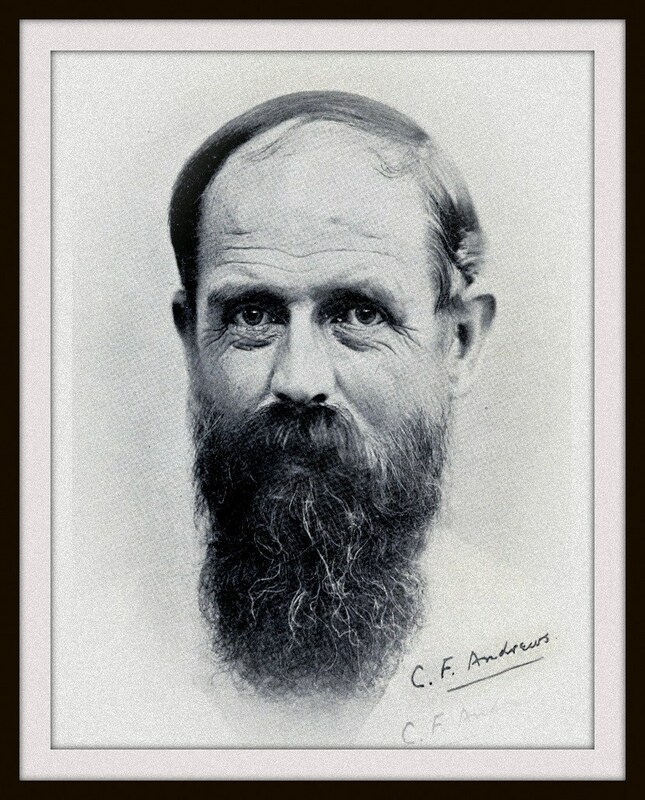 Reverend Andrews kept the British authorities on their toes by fighting for the rights of Indians in the colonies – in South Africa, Fiji, Mauritius, Guyana, even Canada. And in India, for the rights of women, the so-called backward castes, and so on. Reverend Andrew was stopped from entering the Panjab, however some how he gained accessed to the Panjab. 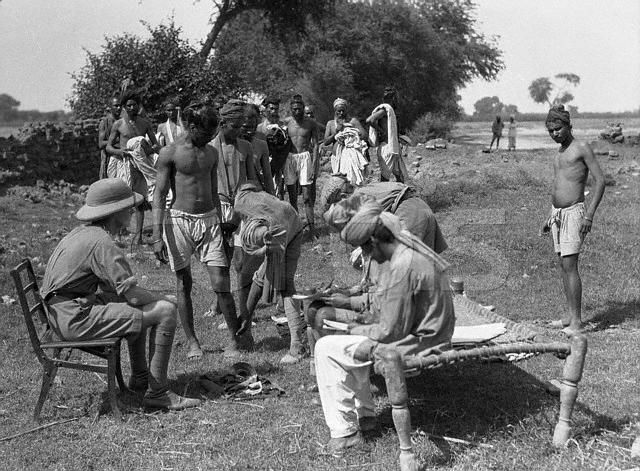 The things he witnessed in Panjab were written and published to ensure that the world, in particular people living in Britain, knew what was happening. It was a sight which I never wish to see again, a sight incredible to an Englishman. There were four Akali Sikhs with black turbans facing a band of about two dozen policemen, including two English officers. They had walked slowly up to the line of police just before I had arrived and they were standing silently in front of them at about a yard’s distance. They were perfectly still and did not move further forward. Their hands were placed together in prayer and it was clear that they were praying. Then, without the slightest provocation on their part, an Englishman lunged forward the head of his lathi [staff] which was bound with brass. He lunged it forward in such a way that his fist which held the staff struck the Akali Sikhs, who were praying, just at the collar bone with great force. There has been something far greater in this event than a mere dispute about land and property. It has gone far beyond the technical questions of legal possession or distraint. A new heroism, learnt through suffering, has arisen in the land. A new lesson in moral warfare has been taught to the world…. It reminded me of the shadow of the Cross. It was very rarely that I witnessed any Akali Singh, who went forward to suffer, flinch from a blow when it was struck. Apart from the instinctive and slight shrinking back, there was nothing, so far as I can remember, that could be called a deliberate avoidance of the blows struck. The blows were received one by one without resistance and without a sign of fear. Andrews, C.F., Manchester Guardian, February 15 and February 24, 1924. 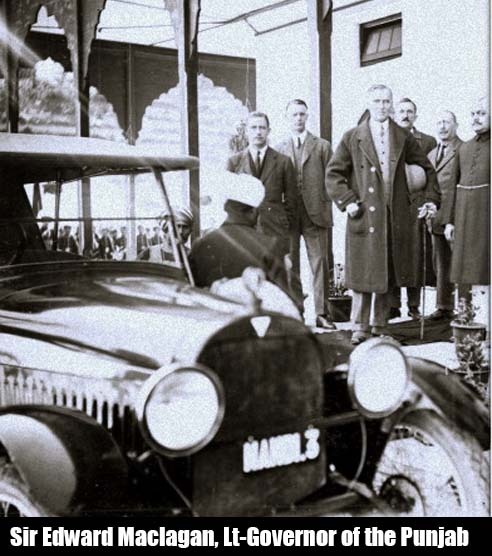 Sir Edward Maclagan, Lt-Governor of the Punjab, visited Guru ka Bagh on 13 September 1922. Under his orders, the beating of the volunteers was stopped. Mass arrests, imprisonments, heavy fines and attachment of properties were resorted to. At the government announcement that preparations were being made to accommodate ten thousand Akalis in gaols, the Sikhs stepped up their campaign. Jathas grew larger in size. Sir Edward Maclagan, Lt-Governor of the Punjab, visited Guru ka Bagh on 13 September 1922. In the first week of October, the Governor-General Lord Reading held discussions with the Governor of the Punjab at Shimla to find a way out of the impasse. The good offices of a wealthy retired engineer of Lahore, Sir Ganga Ram, were utilized to resolve the situation. Sir Ganga Ram acquired on lease, on 17 November 1922, 524 kanals and 12 marlas of the garden land from Mahant Sundar Das, and allowed the Akalis access to it. He also wrote to government that he required no police protection. The government had the excuse not to interfere with the Sikhs who could now go unmolested to Guru-ka-Bagh to cut wood in the jungle for their Langar. The Sikhs’ gain was not confined merely to the immediate point involved. The moral implication of the issue was far more important. On 27 April 1923, Punjab Government issued orders for the release of the prisoners. Thus ended the morcha of Guru ka Bagh in which,. according to Shiromani Gurdwara Parbandhak Committee records, 5,605 Sikhs went to jail. However, the Sikh’s trials had not ended. For protesting against the deposition of the Sikh Maharaja of Nabha, known for his sympathy with the Akalis and other nationalist elements, the Shiromani Gurdwara Parbandhak Committee was, on October 13, 1923, declared an unlawful organization. Next morcha (front) in this war was Gurdwara Jaito at Nabha.